Salisbury steak is one of those dishes that are seemingly expensive in fine restaurants, making you wonder what are the pricey ingredients involved in the making of dish. Where do the ingredients come from? What are they made of? In reality though, Salisbury steak is very easy to make and do not require fancy and exotic food stuff. It is relatively inexpensive to make too. 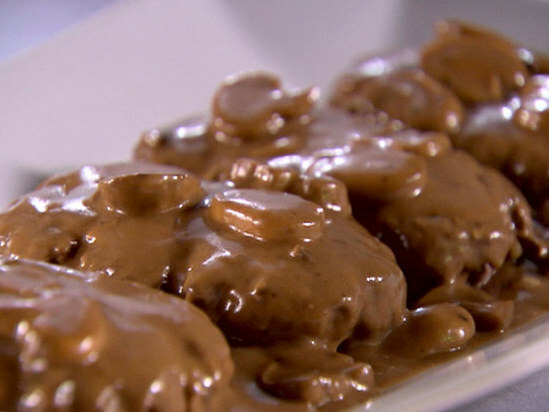 Salisbury steak is really just beef patties that have been grounded and then smothered in flavourful gravy. This recipe is quick to prepare and preparation can be done on just a stove – top. The instructions below are a breeze to follow. Now sit back, relax, and watch as your family members and guests revel at the taste of the Salisbury steak you prepared. With the use of a bowl, mix 1/3 cup of French onion soup with the ground beef, salt, pepper, egg and the bread crumbs. Form this into oval – shaped patties. With the use of a frying pan, brown the patties. The fat must be drained. After this, remove the patties and keep the patties warm. Slowly blend the flour with the remaining soup. Continue to combine the mixture until it is smooth. Next, add the mustard, the Worcestershire sauce, the ketchup and the water. Blend the ingredients well. After this, add the mixture to the frying pan. Bring the heat to a boil. Stir the mixture reduce the brown bits. Cover the mixture with a lid and cook for a period of five minutes. You will have to stir occasionally. Transfer the patties to the gravy in the pan. Cover the pan again with a lid and simmer for a period of fifteen minutes.